First of all, if you think that Cinco de Mayo is Mexico's Independence Day, then you are misinformed! Mexico's Independence Day is actually on September 16. Read on to find out what Cinco de Mayo really is! Cinco de Mayo is Spanish. Translated into English, it means fifth of May. S ome people spell it Cinco demayo or Cincodemayo which is incorrect. It all started in Puebla. Puebla is a city in Mexico, located in the state with the same name. Puebla is situated at an altitude of 7200 feet above sea level and about 130 miles southeast of Mexico City. One of our favorite things about Puebla is the pyramid of Cholula that was discovered by the Aztecs in 1176 and is similar to the pyramids in Egypt. We will save the story about our trip to Cholula for another day. Anyway, Puebla was founded in 1532 and has always been an important commercial center in the region and an important place from a military standpoint. Many battles have been fought there, including two battles led by Porfirio Diaz and Ignacio Zaragoza. These battles happened on April 2, 1867 and May 5, 1862. If you read history closer to present time, you will find out that the French did eventually take over the Mexican army. However, Zaragoza did win the battle on May 5, 1862 against all odds. It was two heavily armed French army soldiers for every one Mexican soldier with few weapons, yet Zaragoza and his men won. Zaragoza and his soldiers' heroism, courage, patriotism and victory on that day is what the people of Puebla and many others around the world are celebrating every fifth of May, or Cinco de Mayo. How to celebrate Cinco de Mayo, you may ask? First of all, except for in the Mexican state of Puebla and some other small parts of Mexico, they do not celebrate Cinco de Mayo in the country of Mexico. However, it is celebrated heavily in the United States and other countries. In the United States, it is celebrated by Mexicans and non-Mexicans alike. They celebrate the culture, customs, and traditions of Mexico with emphasis on food, drinks, dance, music, and participating in Cinco de Mayo events. These days. many businesses, organizations and institutions around the United States like to arrange events around Cinco de Mayo with themes and names like Cinco de Mayo Marathon, Cinco de Mayo Beer Fest, Cinco de Mayo Bicycle Race, Cinco de Mayo Feed the Homeless, Cinco de Mayo Horse Race, Cinco de Mayo Music Festival, Cinco de Mayo Concert, Cinco de Mayo Parade and so on. Many of those events do not really have anything to do with Mexico nor do the hosts know what Cinco de Mayo really is. One could argue that some of the growth in the popularity of Cinco de Mayo in the United States is due to profit hungry businesses that want to make an extra buck on selling Cinco de Mayo merchandise. Many would say that Mexican food is already a big part of the American Cuisine these days, but it becomes even more popular and important on Cinco de Mayo. Restaurants, picnic blankets, and dinner tables across America are filled with Mexican food on Cinco de Mayo. Typical Cinco de Mayo foods include tacos, burritos, gorditas, chalupas, nachos, chimichangas, enchiladas, fajitas, flautas, tamales, taquitos, tostadas, and quesadillas. Research Maniacs have found many places on the Internet that have great Cinco de Mayo recipes. There are all kinds of exotic "Cinco de Mayo drinks" created by bars and restaurants all of the United States, however we think these three are the best: Margaritas, Tequila, and Corona with lime. Whether you are Mexican or not, have a fun, happy, and safe Cinco de Mayo party and start your own Cinco de Mayo traditions. The above information was created by Research Maniacs and may not be copied or reproduced in any way, shape, or form without written consent from Research Maniacs. 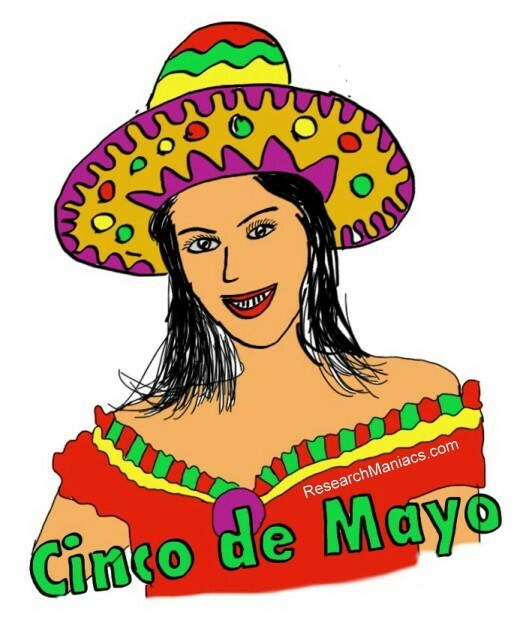 On our 'what is Cinco de Mayo facts page' we give you information about: What is Cinco de Mayo, Cinco de Mayo food, Cinco de Mayo History, Cinco de Mayo recipes, Cinco de Mayo definition, Cinco de Mayo drinks, how to celebrate Cinco de Mayo, and much more. We hope you will have a happy Cinco de Mayo.